The number of people who died in the attack at Dusit D2 hotel and business complex in Nairobi on Tuesday has reached 21, the Nile Post has learnt. Kenyan President Uhuru Kenyatta on Wednesday said that 15 people had been killed in the attack but a statement released by the Inspector General of Police, Joseph Boinnet put the death toll at 21. “Following further forensic work, six other bodies were found at the scene and one police officer succumbed to injuries while undergoing treatment,”Boinnet said in a statement. He identified the dead as 16 Kenyan nationals, a Briton, an American and three other people of African descent yet to be identified. 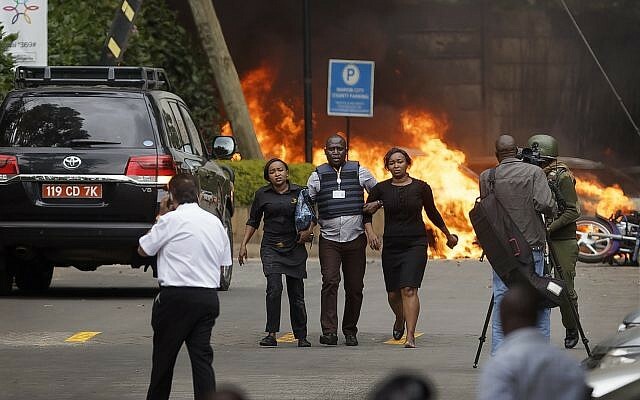 On Tuesday afternoon, terrorists forced their way into the Dusit D2 hotel and business complex in Nairobi which has 101-room hotel, spa, restaurant and office buildings before an explosion targeting cars in the parking lot and suicide bombing went off in the foyer of the hotel. The attack prompted a 21 hour operation by Kenya’s security forces that ended on Wednesday with killing of all the attackers whereas over 700 people had been rescued. According to the Kenyan police chief, their subsequent investigations into the attack have led to arrest of two suspects believed to have facilitated the attack adding that 28 people are admitted in various hospitals in Nairobi. He commended the multi-agency security teams that helped put the attackers out of action before returning the situation to normal. President Kenyatta said on Wednesday that his government will not waiver under the attacks of terrorists but instead pursue them and bring them to justice.